On the first day of his surf trip in Tamarindo March 6, Montreal native Val Muscalu was waiting his turn for a wave when suddenly he was ripped off his board. Muscalu felt something strong clamp down on his left foot. He remembers kicking out and swimming backstroke to shore, but everything else is a blur. It was only later, on his way to the hospital, that Muscalu learned the identity of his underwater assailant: a crocodile. Other surfers helped Muscalu wrap his rash guard around his foot and someone rushed him to a doctor. Long curvy scars and puncture wounds consistent with a croc bite now run along the left side of Muscalu’s foot. But by all accounts the surfer got off easy. Muscalo — a former member of the Canadian National Waterpolo team — was strong enough to tread water even while the crocodile tried to tug him under, and paddle his way to shore with a serious wound. 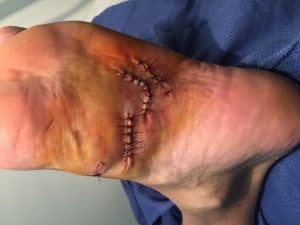 “There was damage up the tendon, but I thought it could be a lot worse,” Dr. Luis Diego Herrera, the doctor who treated Muscalu, told The Tico Times. American crocodiles don’t usually attack humans. And most croc attacks that do occur aren’t fatal. But not everyone gets off as easy as Muscalu. Normally, crocodiles bite down on their prey and drag it underwater. Muscalu’s attack follows a series of others in recent years. Last year a man was eaten alive while attempting a drunken swim in the croc-infested Tarcoles river. Several months later, a wildlife expert was mauled while giving a demonstration on proper crocodile relocation. Since 2013, there were five other reported attacks, including one — on a Spanish surfer in October 2013 — in the same spot where Muscalu was attacked. The surfer’s injuries were minor. There’s no way to confirm if the two attacks were by the same crocodile, but locals say that over the past few years they’ve spotted one particular croc leaving the nearby Playa Grande estuary to hunt. “In at least 22 years we have only had this one serious attack,” Urs Schmid, president of the Tamarindo Development Association, said of Muscalu’s encounter. In response to the attack, the development association wrote a letter to the Environment Ministry (MINAE) asking for help with the crocodiles. The letter asked the ministry to repost the crocodile warning signs that used to be in the area but were stolen, and to begin studying the area’s crocodiles to determine which ones should be relocated. MINAE officials responded to the note Tuesday afternoon and will meet with the development association Thursday to form a plan. The association’s complaint is not isolated. Last year, the Costa Rican Chamber of Hotel Owners wrote an open letter to MINAE asking for controls on the crocodile population. In the letter, the chamber’s president alleged that tourists were getting scared off by an increasing number of crocodiles on beaches and in other heavily-populated areas. Costa Rican law permits the relocation or euthanization of crocodiles in cases of overpopulation or, in rare cases, for safety. But crocodile experts say it’s often people, not crocodiles, who cause a problem. 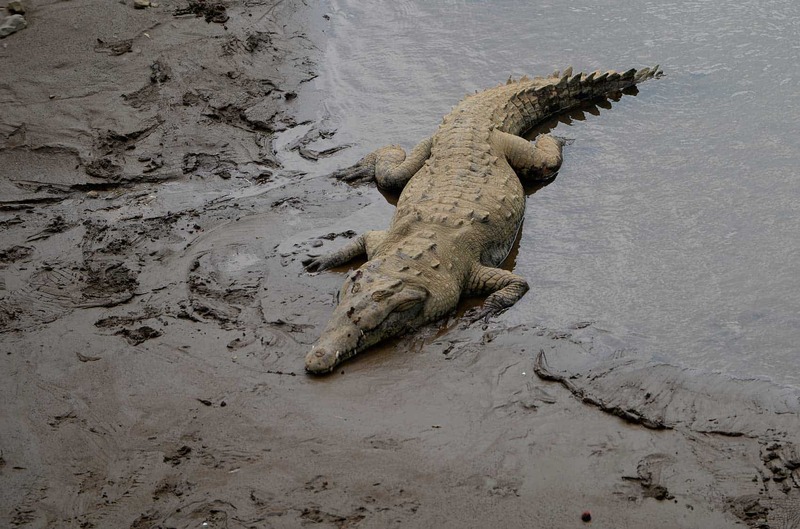 In Costa Rica, in particular, the prevalence of ecotourism and the habitual feeding of crocs by tour operators has made the animals accustomed to people. Schmid said feeding crocs has been a problem in Tamarindo. “I’ve seen some of the river guides do it in the past, as well as some restaurants,” Schmid said. He said he wanted MINAE to train the local guides to stop feeding crocs. Besides removing problem crocodiles, Schmid said his group hopes to come up with other ways to prevent attacks. Locals have noted that the crocodile who leaves the river mouth usually does so in the early morning or late afternoon when there are more fish in the area. If MINAE studies are able to confirm that the crocodile only hunts at certain times, the solution may be as simple as asking surfers to keep away from the estuary during certain times of the day. Despite Muscalu’s scare, the Canadian said he won’t give up on surfing in Costa Rica. Once he heals, he wants to return and get back in the water — but not near an estuary and not in the late afternoon or early morning.